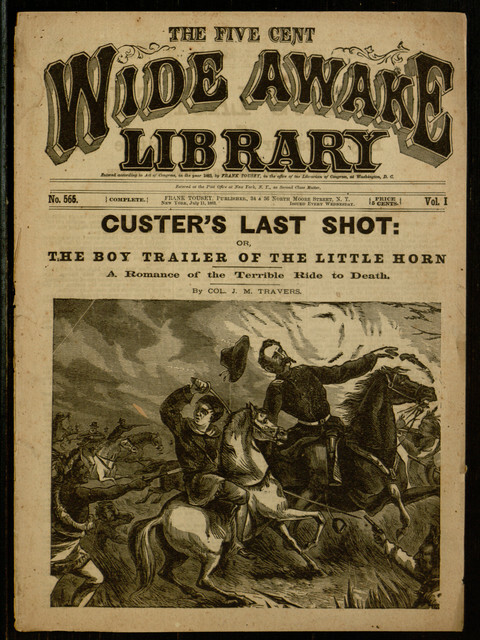 Our latest title to be made available to Distributed Proofreaders is Custer’s Last Shot; or, The Boy Trailer of the Little Horn, an adventure from Frank Tousey‘s Wide Awake Library. The dime novel tells the tale of the 1876 Battle of the Little Bighorn, an event that was still well within living memory at the time of the book’s 1883 publication. It was an early fictional representation of George Armstrong Custer, and far from the last. If you would like to help make this historically interesting title more readily available in eBook formats, a few minutes of your time can make a difference. Please read this earlier post to learn how the process works, then join in the proofreading at the project page.